Freedom Innovations’ Plié® 3 Microprocessor Knee is engineered to accommodate amputees seeking a knee that adjusts to walking, running, uneven terrain, and occasional water exposure. Target users for the product include K3 amputees that require customized stumble recovery for a range of activities, high K3 and K4 amputees that require a knee that adjusts to both walking and running, and those who have adequate hip strength in flexion and extension. With responsive stumble and fall protection, users can instinctively move at their own pace in any direction — even if it’s taking small short steps or pivoting in confined spaces. The Plié 3’s Rapid Response technology delivers a more natural transition from swing to stance. With the technology’s resistance based on swing flexion and not speed, the resulting effect is an instinctive action that for the user feels more like a biological knee and ultimately reduces the amount of effort and energy used by the amputee. More rugged internal components designed to improve durability. Remote access battery option for one-piece cosmetic covers. Interchangeable batteries for on-the-go convenience. Improved stance flexion resistance bezel designed for durability. Proprietary sensor and load cells with customized setting for advanced stumble recovery. 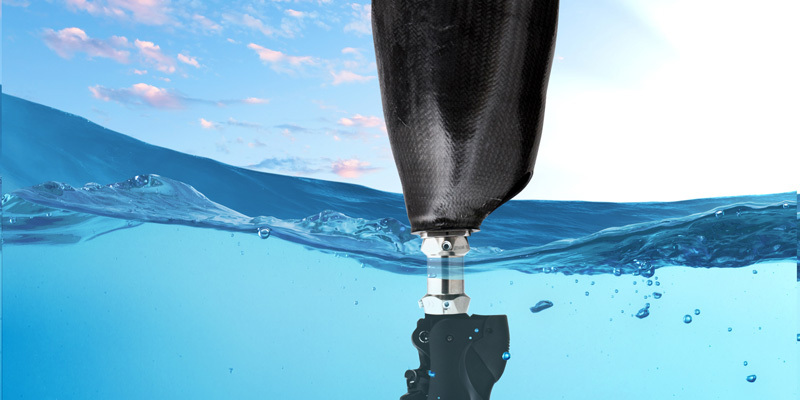 Water-resistant coated electronics mean the knee can be safely submersed in fresh shallow water for up to 30 minutes at a time.